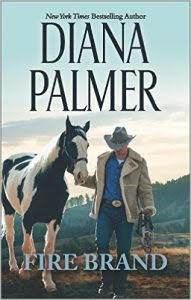 Ever since I watched The Longest Ride on Netflix I've been craving cowboy romance novels, so I was looking forward to reading Fire Brand by Diana Palmer. This is a republication of the original novel from 1989. It was a quick read, and I generally liked Gaby as the lead female character. She may not have a lot of experience with men and relationships, but she sure didn't back down from Bowie when she disagreed with him professionally. My favourite part came early on when the Palmer is describing Gaby. "...a perfect twelve"!!! Yes! I loved this so much. Maybe that's one of the benefits of reading a book from another generation. Societal expectations shift and sway so much and not always for the better. While I thought Gaby was a good character, I really struggled with Bowie. Though it is clear that he cared for Gaby, I did not like how he spoke to and treated Gaby most of the time. Even when he finds out her secret, he tries to be understanding, but he comes across as pretty immature about it. I appreciated that the communication between Gaby and Bowie was honest. There was no all-too-common "misunderstanding" that we see in romance books. Bowie knew that Gaby had a secret and loved her anyways, even if I felt he could have showed his love and support for Gaby differently. Disclaimer – I received a copy of Fire Brand from the publisher and TLC Book Tours in exchange for my review. All thoughts and opinions are entirely my own. To check out what other bloggers had to say about Fire Brand and read a few excerpts, here is the full book tour. Enjoy!